In Abundance: The Future Is Better Than You Think, Peter H. Diamandis and Steven Kotler explored how four potent emerging forces—exponential technologies, the DIY innovator, technophilanthropists and the rising billion—give us the power to solve many of the world’s grandest challenges and the potential to meet the needs of every man, women and child over the next two to three decades. In BOLD, they offer the next step: a highly practical playbook that arms today’s entrepreneurs, activists and leaders with the tools they’ll need to positively impact the lives of billions while making their biggest dreams come true. BOLD unfolds in three parts. Part One focuses on the exponential technologies which are disrupting today’s Fortune 500 companies and enabling upstart entrepreneurs to go from ‘I’ve got an idea’ to ‘I run a billion-dollar company’ far faster than ever before. With advice garnered from their own experience and hundreds of interviews with Silicon Valley elite, the authors provide exceptional insight into how anyone can harness the power of 3D printing, artificial intelligence, robotics, networks and sensors, and synthetic biology—the very technologies enabling today’s entrepreneurs to tackle the kinds of enormous challenges that were once only possible for governments and major corporations. Part Two of the book focuses on Psychology of Bold—the mental toolkit that allows the world’s top innovators to raise their game by thinking at scale, including detailed interviews and lessons from Larry Page, Elon Musk, Richard Branson and Jeff Bezos. Also in Part Two, Kotler reveals the keys to ultimate human performance garnered from fifteen years of research with the Flow Genome Project and Diamandis reveals his entrepreneurial secrets garnered from building fifteen companies, including such audacious ventures as Singularity University, the XPRIZE, Planetary Resources (for the mining of near-Earth Asteroids) and Human Longevity, Inc. (focused on extending the healthy human life-span). Finally, BOLD closes with a look at the incredible power and essential best practices that allow anyone to leverage today’s hyper-connected crowd like never before. Here, Diamandis and Kotler teach how to design and use incentive competitions to find breakthrough solutions, how to launch million-dollar crowdfunding campaigns to tap into ten’s of billions of dollars of available capital, and finally how to build communities – armies of exponentially enabled individuals willing and able to help today’s entrepreneurs make their boldest dreams come true. Pick up copies for yourself and your colleagues on Amazon. "In BOLD, Diamandis and Kotler have written another dazzler. A riveting look inside the world of exponential entrepreneurship—action-packed and action-oriented. I’ve purchased a copy for my entire team at Cisco." "If you read one business book in the twenty-first century, this should be the one. When Peter and I cofounded Singularity University, we based it on the ideas of exponential change and ‘learn by doing.’ This book clearly explains how to apply these concepts to change the world and overcome the age old afflictions of human civilization." "BOLD is a visionary roadmap for people who believe they can change the world---and offers invaluable advice about bringing together the partners and technologies to help them do it." "Abundance showed us where our world can be in 20 years. BOLD is a roadmap for entrepreneurs to help us get there." "I loved Peter Diamandis’ and Steven Kotler’s book Abundance, their writing and their Vision. 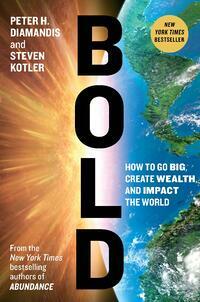 BOLD is an amazing sequel, a book that every entrepreneur should read. It is inspiring, filled with incredible insights and offers a practical how-to game plan for going big and impacting the world." "This is a manual for today’s big thinkers to become tomorrow’s bold leaders, using crowd-powered tools accessible to everyone."